The Mobile Institute for Citizenship and Art (MICA), is a nomadic platform for research, dialogue and exchange, oriented toward understanding how historically marginalized communities redraw the parameters for political membership by mobilizing social/cultural resources and activating communal spaces: redefining how citizenship can (and should be) understood and enacted as process. 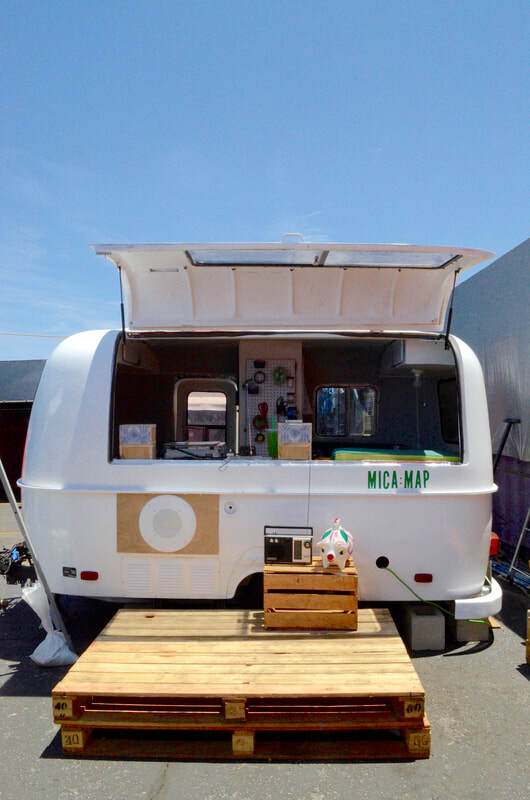 MICA is housed within a retrofitted fiberglass trailer, which functions as a research hub, reading space, listening station, recording studio and hyper-local FM radio station. For its initial initiative, the Mobile Agora Project (MAP), MICA takes residence in public markets, establishing an outpost to undertake workshops, performative actions and artistic interventions in collaboration with vendors, local artists, and community organizations. Through such participatory research strategies, MAP analyzes how such spaces facilitate forms of cultural and economic exchange amongst and between the transnational publics who frequent such markets -- largely immigrant, working-class, POC, inter-generational communities -- and asks whether these can become incubators for forms of political solidarity that transcend national boundaries and socio-cultural divides: (re)imagining and (re)constituting parameters of citizenry. We will be publishing our analysis and reflections in the forthcoming publication, Regionalia, which will be published by California State University, Fullerton, Grand Central Art Center, in the Summer 2019. The first iteration of the project, MAP:LA, took place at the Santa Fe Springs Swap Meet in south Los Angeles during June 2016. This pilot version featured collaborations with Manos Unidas Creando Arte, an artisan cooperative of women designing economically + environmentally sustainable crafts with material sourced from their communities in Santa Ana, CA, with Resilience Orange County, a youth activist group organizing against the criminalization and deportation of immigrants who live, go to school and/or in Orange County, and with the Tijuana-based DIY-editorial press Kodama Cartonera. The second iteration of the project, MAP:TJ took residence within the Mercado Sobreruedas Pancho Villa in Tijuana during May 2017. During this more research-focused iteration of MAP, we collaborated with Universidad Autónoma de Baja California Professor Christian Zuñiga, and students from the departments of Art and Communication. Together we undertook a series of research exercises, analyzing the logics and space of the market, after which students were invited to develop interventions reflecting on dynamics they experienced. As part of our activities, we conducted and recorded interviews with Tijuana-based researchers Geovanni Zamudio, and Carolina Garcia, whose work focuses on public markets in the city Tijuana. Pepe Rojo of the Comite Magonista Tierra y Libertad was also invited to host a pirate-radio broadcast from within the trailer, featuring the reading of political manifestos and poetry. To conclude, a series of “Magonista” flags crafted in the space, were used as banners in a procession through the market. One of MAP’s intentions is to collaborate with immigrant-rights groups to facilitate workshops and actions within the market. For MAP: LA, we worked with Orange County-based Resilience Orange County, and members of the Spurgeon Intermediate School Social Justice Club, to design + facilitate a workshop that would adapt the aesthetics of protest to the context of a Swap Meet. The resulting action, "Protest Balloons," invited participants to articulate their political demands on mylar balloons in response to the political rally cry “What do we want?” -- as immigrants/youth of color/latinxs/chicanxs/etc. To conclude the workshop, a march was undertaken through the market flying the balloons in place of picket signs. This workshop was also facilitated as part of MAP:TJ in collaboration with the Comité Magonista Tierra y Libertad. During both interventions participants were given the choice to take their balloons with them to carry through the market and back to their communities, or leave and donate their balloons to the project archive, which frames and preserves these for future exhibitions/presentations. Recently, we adapted the project as part of an exhibition at Grand Central Art Center to interrogate conceptions of "American Citizenship." Support to complete this project was provided by the Art Matters Foundation and by SPArt | Social Practice Art.